Model LH8360 Die Attach Film Laminator from Longhill Industries Ltd.: Adapting the proven Longhill roller-LESS vacuum laminating process to wafer scale packaging. DAF film and wafer are brought together in a vacuum chamber with very high quality and uniform results. The vacuum laminating process virtually eliminates air bubbles captured between the film and the wafer. Both DAF covering layers automatically removed prior to the laminating process, no post laminating film removal required. The LH8360 is designed from the ground up with very thin wafer capabilities. Input from cassettes or coin stack wafer boxes. Equipped with a Bernoulli Effect wafer robotics, non contact alignment and tolerant of severely warped wafers. 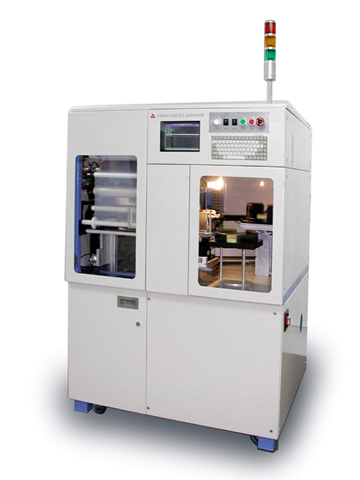 Programmable cutting blade cleanly excises the wafer from the film. Various curing and heat assisted options can be implemented. Model LH8362 The 300mm capability version is also available.